Have a look at these 8 must-have products that pay tribute to CNY 2019, which you should consider getting your hands 'ong'. There's no better time to see red than during the Lunar New Year – from décor, to attires, the special envelopes you're going to be receiving so many of... and even through and on makeup! In this article, we round up a list of products that will help ring in the new year, and undoubtedly keep you looking your best throughout the festivities. Lancôme’s Advanced Genifique and the L’Absolu Rouge lipstick in shades #290 and #118 are part of the hero products this Chinese New Year. As we've iterated before, the brand will be giving away freebies at the main entrance of Pavilion throughout this CNY period, so be sure to pop by. By the way, did we mention that you might also win a trip to Paris? SK-II's award-winning and best-selling Pitera and Facial Treatment Essence makes a limited edition appearance this year as well, through a bold and modern design set in a vibrant red and a swirl that alludes to the Chinese character for "spring". To ensure your skin looks its best, use this to condition skin, boost hydration and keep skin smooth, radiant and moisturised. Photo: Courtesy of M.A.C Cosmetics. 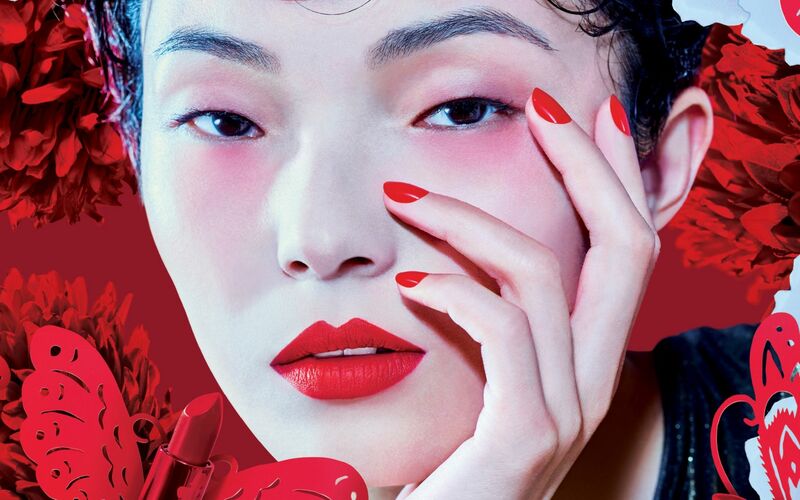 Fortune favours the bold, says M.A.C, so get brave and get lucky with its latest Lucky Five Lunar  New  Year set – which includes five fearless lipsticks and peony-printed gifts which include a brush, pressed powder and blush. Sold every four seconds, L'Occitane's best-selling shea butter hand cream gets the Chinese New Year Limited Edition treatment this year, housed in a vibrant and cheery red packaging. Each tube contains 20% butter, a blend of almond, honey and coconut oil. Guerlain's limited edition, metallic-red formula is enriched with the famous plumping hyaluronic acid spheres – with which lips are immediately and noticeably full and soft. Don't worry about them cracking though, because the Commiphora oil ensures smooth surfaces for long hours. The symbolic colours of red and gold adorn the must-have limited editions of Givenchy's iconic loose setting powder, the Prisme Libre, which evens out the skin, boosts radiance and keeps shine under control. Its lipstick on the other hand, is lightweight, ultra-smooth and defines your lips to help you looking good even after hours of feasting. What better way to get into the true spirit of prosperity than by owning a piggy bank with which to stuff all your angpaos? Indeed, Benefit does think ahead with its Limited Edition Piggy Banks set, which come with a mini Benefit Cosmetics favourites such as brow pomades, blush, mascara and primer. Photo: Courtesy of BECCA Cosmetics. This luxurious rose gold packaging with silver logo detailing that makes BECCA Cosmetics' latest exclusive highlighter exudes both luxury and celebratory vibes. Ring in the Lunar New Year with this pressed powder palette which has a graphic imprint of the animal of the year. It has a soft, peachy pink pigment with hints of gold and silver pearls.